Thorndike Press, 2000-11-01. Hardcover. Used:Good. 2001-01-03. New. Ships with Tracking Number! INTERNATIONAL WORLDWIDE Shipping available. Buy with confidence, excellent customer service! 2001-05-08. New. Ships with Tracking Number! INTERNATIONAL WORLDWIDE Shipping available. Buy with confidence, excellent customer service! 2001-01-04. New. Ships with Tracking Number! INTERNATIONAL WORLDWIDE Shipping available. Buy with confidence, excellent customer service! 2000-07-09. New. Ships with Tracking Number! INTERNATIONAL WORLDWIDE Shipping available. Buy with confidence, excellent customer service! Back Bay, 2000-01-01. Paperback. Used:Good. 2001-09-02. New. Ships with Tracking Number! INTERNATIONAL WORLDWIDE Shipping available. Buy with confidence, excellent customer service! 2000-02-01. New. Ships with Tracking Number! INTERNATIONAL WORLDWIDE Shipping available. Buy with confidence, excellent customer service! 2010-01-02. New. Ships with Tracking Number! INTERNATIONAL WORLDWIDE Shipping available. Buy with confidence, excellent customer service! 2001-05-05. New. Ships with Tracking Number! INTERNATIONAL WORLDWIDE Shipping available. Buy with confidence, excellent customer service! 2000-09-08. Good. Ships with Tracking Number! INTERNATIONAL WORLDWIDE Shipping available. May not contain Access Codes or Supplements. May be ex-library. Shipping & Handling by region. Buy with confidence, excellent customer service! 20010104. Good. Ships with Tracking Number! INTERNATIONAL WORLDWIDE Shipping available. May not contain Access Codes or Supplements. May be ex-library. Shipping & Handling by region. Buy with confidence, excellent customer service! Boston, MA: Little, Brown & Company, 2000. First Edition. First Printing.. Hardcover. Fine/Fine Dust Jacket.. Boston, MA: Little, Brown & Company, 2000. Hardcover. Fine/Fine. First Edition/First Printing. 272 pages. The author's breakthrough fourth collection of essays and short stories. Now considered a contemporary classic. The First Hardcover Edition. Precedes and should not be confused with all other subsequent editions. Published in a small and limited first print run as a hardcover original only that sold out shortly after publication. The First Edition is now scarce. 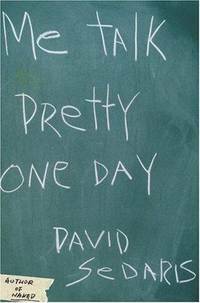 Presents David Sedaris' "Me Talk Pretty One Day". Published to near-unanimous critical and popular acclaim. The book transformed David Sedaris, already the author of three brilliant books, from a writer with an ardent cult following into a bestselling national and international writer. "Mines poignant comedy from his peculiar childhood in North Carolina, his bizarre career path, and his move with his lover to France. Though his anarchic inclination to digress is his glory, Sedaris does have a theme in these reminiscences: The inability of humans to communicate. The title is his rendition in English of how he and his fellow students of French mangle the Gallic language" (Tim Appelo). Sedaris continues to use his utterly dysfunctional Greek-immigrant family as the basis for his best pieces. If anything, he uses them more rather than less than ever, and his devoted readers now feel as though they know them better than their own family. He has written about his homosexuality and romance with Hugh more discreetly but quite openly (he never makes fun of him, for instance, and seems truly smitten). An absolute "must-have" title for David Sedaris collectors. <b><i> This copy is very prominently and beautifully signed and inscribed in black ink-pen on the title page by the author: "With a sincere feeling, David Sedaris". It is signed directly on the page itself, not on a tipped-in page. The recipient is named. This title is a contemporary classic. This is one of few such signed copies of the First Hardcover Edition/First Printing still available online and is in especially fine condition: Clean, crisp, and bright, a pristine beauty. Please note: Sedaris is a genuine rarity among superstar-writers: He spends time with every single person who has taken the trouble of going to his reading and waiting patiently in line (which are "circle-around-the-block" long) to get his or her book signed. He writes lengthy, personalized inscriptions to those who want them and has been known to sign into the wee hours of the morning. Copies available online have serious flaws or are subsequent printings. A rare signed copy thus. </b></i> One of the finest American writers of our time. A fine copy. (SEE ALSO OTHER DAVID SEDARIS TITLES IN OUR CATALOG). ISBN 0316777722. Thorndike Press, 2001-11-01. Paperback. Used:Good. New York/Boston: Little Brown & Co., 2000. INSCRIBED AND SIGNED BY DAVID SEDARIS. 28 very funny essays by the noted author and the brother of Amy. If there is a funnier writer than David Sedaris please let me know. Light line impressions (not markis) on the front dustjacket which look like they were made by someone who used the book as a leaning device to right something, also price clipped and very faint small soiling to the edge of the back endsheet. Vg+/vg+. First edition/2nd Printing. Boards & Cloth with Dustjacket. Little, Brown and Company. Hardcover. 0316777722 First edition, First Printing. Signed by the author on the title page. Not inscribed, price clipped or otherwise marked. Securely wrapped, dust jacket in protective cover and shipped in a box. Full # line starting with a 1. . Fine. 2000. 1st Edition. Grand Central Publishing, 2001. CD-Audio. New. 5.75 x 5 cm. LITTLE BROWN. New. 8.4 x 5.9 cm. Boston: Little, Brown & Co, 2000. First ed., first printing (full number line). Hardcover. Fine in fine jacket/fine. Medium octavo in blue-green jacket; 272 pages ; 22 cm. Contents: Go Carolina -- Giant dreams, midget abilities -- Genetic engineering -- Twelve moments in the life of the artist -- You can't kill the rooster -- The youth in Asia -- The learning curve -- Big boy -- The great leap forward -- Today's special -- City of angels -- A shiner like a diamond -- Nutcracker.com -- See you again yesterday -- Me talk pretty one day -- Jesus shaves -- The tapeworm is in -- Make that a double -- Remembering my childhood on the continent of Africa -- 21 down -- The city of light in the dark -- I pledge allegiance to the bag -- Picka Pocketoni -- I almost saw this girl get killed -- Smart guy -- The late show -- I'll eat what he's wearing. || "Me Talk Pretty One Day contains far more than just the funniest collection of autobiographical essays - it quite well registers as a manifesto about language itself. Wherever there's a straight line, you can be sure that Sedaris lurks beneath the text, making it jagged with laughter; and just where the fault lines fall, he sits mischievously perched at the epicenter of it all. David Sedaris's new collection, Me Talk Pretty One Day, tells a most unconventional life story. It begins with a North Carolina childhood filled with speech-therapy classes ("There was the lisp, of course, but more troubling than that was my voice itself, with its excitable tone and high, girlish pitch") and unwanted guitar lessons taught by a midget. From budding performance artist ("The only crimp in my plan was that I seemed to have no talent whatsoever") to "clearly unqualified" writing teacher in Chicago, Sedaris's career leads him to New York (the sky's-the-limit field of furniture moving) and eventually, of all places, France. Sedaris's move to Paris poses a number of challenges, chief among them his inability to speak the language. Arriving a "spooky man-child" capable of communicating only through nouns, he undertakes language instruction that leads him ever deeper into cultural confusion. Whether describing the Easter bunny to puzzled classmates, savoring movies in translation (It is Necessary to save the Soldier Ryan), or watching a group of men play soccer with a cow, Sedaris brings a view and a voice like no other--"Original, acid, and wild," said the Los Angeles Times--to every unforgettable encounter."--Jacket. || Americans -- France -- Paris -- Humor. Americans -- France -- Humor. American wit and humor -- 20th century. Americans -- Paris -- Humor. Americans. Engels. American wit and humor -- 20th century. Americans -- Paris -- Humor. Americans -- France -- Humor. Short stories. Humor. Short stories. Humor. Short stories. Back Bay/Little, Brown & Co.. PAPERBACK. 0316777218 New Condition. . New. G K Hall & Co. PAPERBACK. 0783892799 New Condition. . New. Back Bay. PAPERBACK. 0965031136 New Condition. . New. 2010-01-02. Good. Ships with Tracking Number! INTERNATIONAL WORLDWIDE Shipping available. May not contain Access Codes or Supplements. May be ex-library. Shipping & Handling by region. Buy with confidence, excellent customer service! 2001-05-05. Good. Ships with Tracking Number! INTERNATIONAL WORLDWIDE Shipping available. May not contain Access Codes or Supplements. May be ex-library. Shipping & Handling by region. Buy with confidence, excellent customer service! Topeka Bindery. Used - Good. Shows some signs of wear, and may have some markings on the inside. 2000-07-09. Good. Ships with Tracking Number! INTERNATIONAL WORLDWIDE Shipping available. May not contain Access Codes or Supplements. May be ex-library. Shipping & Handling by region. Buy with confidence, excellent customer service! 2001-05-08. Good. Ships with Tracking Number! INTERNATIONAL WORLDWIDE Shipping available. May not contain Access Codes or Supplements. May be ex-library. Shipping & Handling by region. Buy with confidence, excellent customer service! 2001-09-02. Good. Ships with Tracking Number! INTERNATIONAL WORLDWIDE Shipping available. May not contain Access Codes or Supplements. May be ex-library. Shipping & Handling by region. Buy with confidence, excellent customer service! New York: Little, Brown, 2000. First edition, first printing. Hardcover. Hardcover. First edition, first printing. Fine in fine dust jacket. Sedaris' hilarious account of life in Parisand he sought to overcome his aversion to French by taking lessons. Little, Brown, Boston. 2000. Inscribed by the author. 8vo, 272pp. A very good hardback copy in like dust jacket. . Condition: 8vo, 272pp. A very good hardback copy in like dust jacket. Back Bay Books. PAPERBACK. 0316776963 . New. BACK BAY. New. 8.34 x 5.66 cm. New York: Little, Brown, 2000. Second Printing. Hardcover. Hardcover. Second Printing. A fine book in a fine dust jacket. Sedaris' hilarious account of life in Parisand he sought to overcome his aversion to French by taking lessons. Signed by the author on the title page. Little, Brown and Company. Hardcover. 0316777722 First edition, First printing. Not price clipped. NOT REMAINDER marked. Dust jacket in protective cover. Shipped in a box. Number line starting with a (1). Fine/Fine . Fine. Boston, Massachusetts, U.S.A.: Little Brown & Co, 2000 Very good first edition in very good dust jacket.. 1st Edition. Hardcover. Very Good/Very Good. Boston, Massachusetts, U.S.A.: Little Brown & Co, 2000 Fine first edition in fine dust jacket. Complete row of numbers, 10 to 1, on the copyright page.. 1st Edition. Hardcover. Fine/Fine. Back Bay. PAPERBACK. 0965031136 Like New Condition. . Fine. G K Hall & Co. PAPERBACK. 0783892799 Like New Condition. . Fine. Boston: Little Brown. NF/F. 2000. First Edition. Hardcover; First Printing. No remainder mark. Just a touch of shelf wear. ; 2015 . Little, Brown and Company. Hardcover. 0316777722 Special order direct from the distributor . New. Little Brown & Co. Humour, Fashion & Entertainment. New. Brand New: This item is brand new unopened, never used and still in its original manufacturer condition. Boston: Little, Brown & Co, 2000. Hardcover. 272p., color illustration by Owen Smith clipped from magazine and pasted-down on the page opposite title page by previous owner, signed by Sedaris on title page, otherwise a very good first edition in boards and unclipped dj. While the illustration is colorful and delightful it is unfortunate that the previous owner did this. 2001 Lambda award winner for humor. Little, Brown and Company, 2000. Clean and bright; no owners' or remainder marks; mild shelf rubbing at corners and spine ends of hard cover, a few tiny wrinkles at spine head of dust jacket, otherwise excellent. Jacket is unclipped and now protected in a clear sleeve.. First Printing. Hardcover. Near Fine/Near Fine.